Earthborn Holistic® Chicken Fricatssee™ Chicken Dinner with Vegetables in Gravy is packed with fleshy cuts of white meat chicken, wholesome vegetables and fruits and hearty pieces of potato. This grain and gluten-free moist dinner is an exceptional source of high-quality protein, vitamins, minerals and beta-carotene, aiding in overall health and physical well-being. 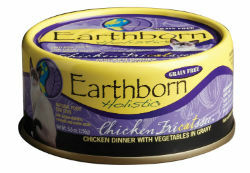 Earthborn Holistic® Chicken Fricatssee™ Chicken Dinner with Vegetables in Gravy is formulated to meet the nutritional levels established by the AAFCO Cat Food Nutrient Profiles for adult maintenance.